Meeting with Canadian Parliamentarian Michael Levitt, Chairman of the Standing Committee on Foreign Affairs and International Development of the House of Commons. 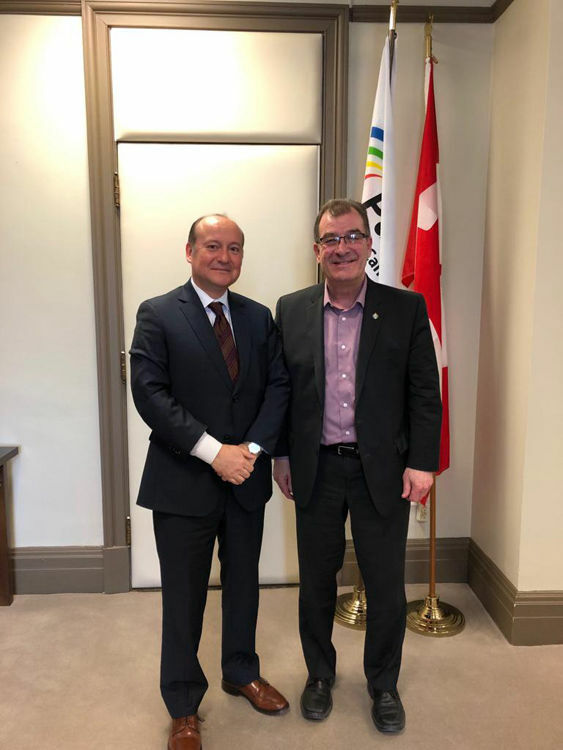 The Ambassador of Peru, Roberto Rodríguez Arnillas, had a productive meeting with The Honourable Bob Nault, Member of Parliament, in which he discussed, among various issues, the interactions between development projects and nearby communities, subject in which Mr. Nault has ample experience. 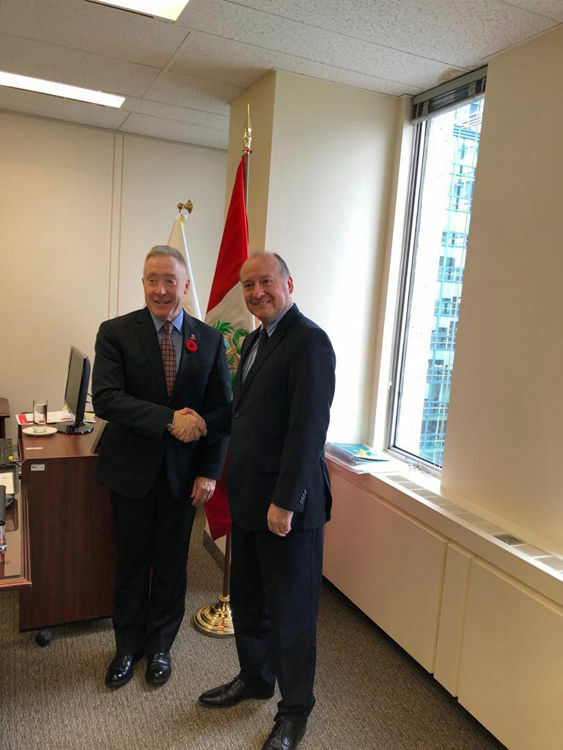 Mr. Nault, who is also the President of ParlAmericas, expressed his interest to continue this first dialogue in the near future in order to contribute to the reinforcement of Peru-Canada’s friendship and cooperation. 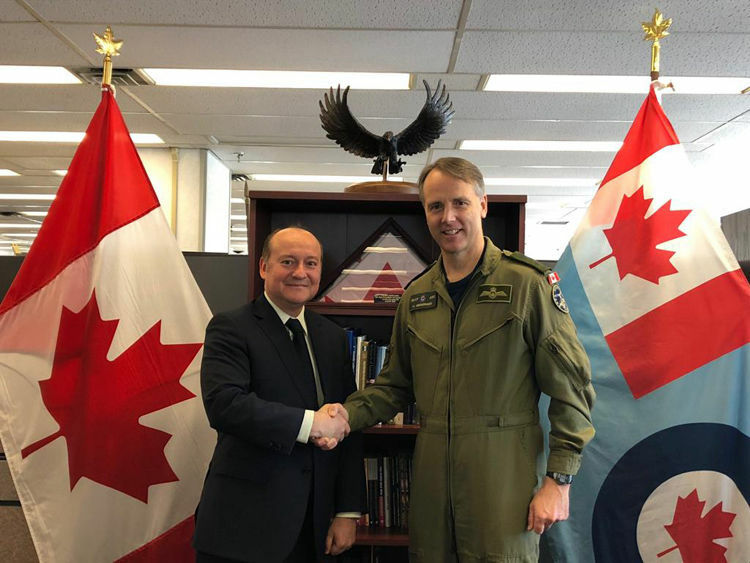 Today Ambassador Roberto Rodríguez Arnillas met with the Commander of the Royal Canadian Air Force, Lieutenant-General Alexander Meinzinger. They reviewed the main defense issues that are part of the bilateral agenda, with a special emphasis on the Peruvian and Canadian Air Forces. The meeting identified potential future efforts towards enhancing bilateral cooperation and exchanging experiences between both military institutions. 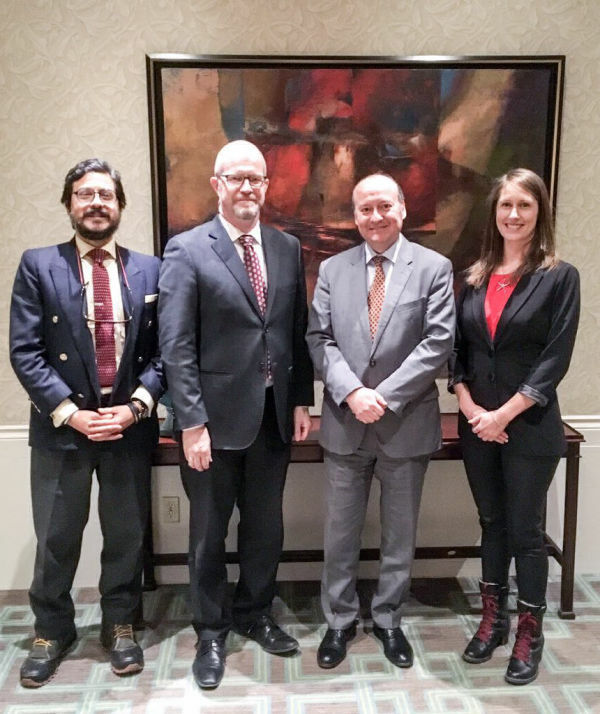 On November 23th, Ambassador of Peru, Roberto Rodríguez, held a working meeting with Mr. Garth Frizzell, Second Vice-President of the Federation of Canadian Municipalities (FCM), to discuss aspects related to the cooperation that the FCM grants to Peru through the CISAL Program (Sustainable and Inclusive Communities in Latin America) whose objective is to strengthen the municipal management capacities in aspects such as governance and economic development, especially in those areas of mining activities. On November 22, Ambassador Roberto Rodríguez Arnillas met with the Vice Chair of the Standing Committee on Foreign Affairs and International Development of the House of Commons, Mrs. Hélène Laverdière, member of the New Democratic Party. During the conversation, both highlighted the important level of Canadian investments in Peru, the numerous cooperation projects already underway, and the possibility of developing new projects in areas related to the environment, indigenous communities and women's empowerment. The occasion was also an opportunity to ratify the coincidence of visions that guide the actions of both countries with respect to the protection of human rights and democratic institutions. 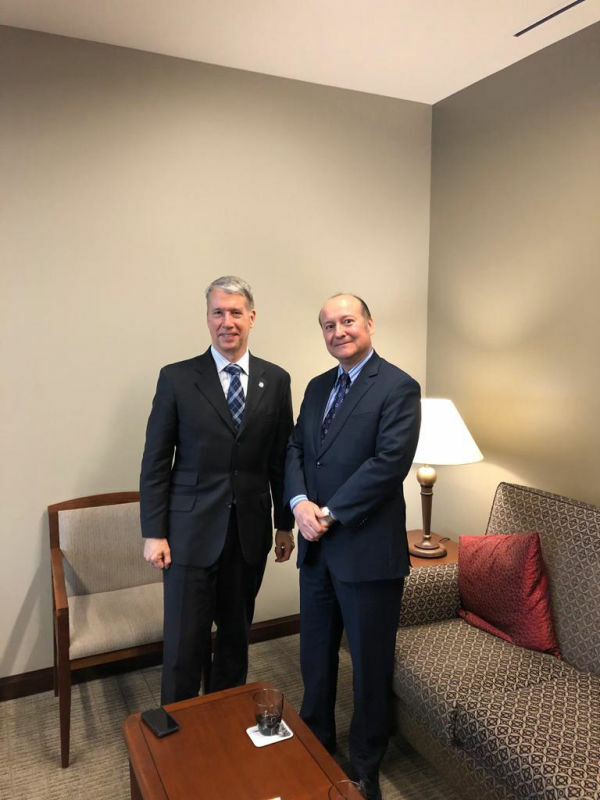 On November 22 Ambassador Roberto Rodríguez Arnillas met with MP Andrew Leslie, Parliamentary Secretary to the Minister of Foreign Affairs and retired Lieutenant General of the Canadian Army. The occasion served to highlight the excellent level of bilateral relations and the close relationship between the armed institutions of the two countries. 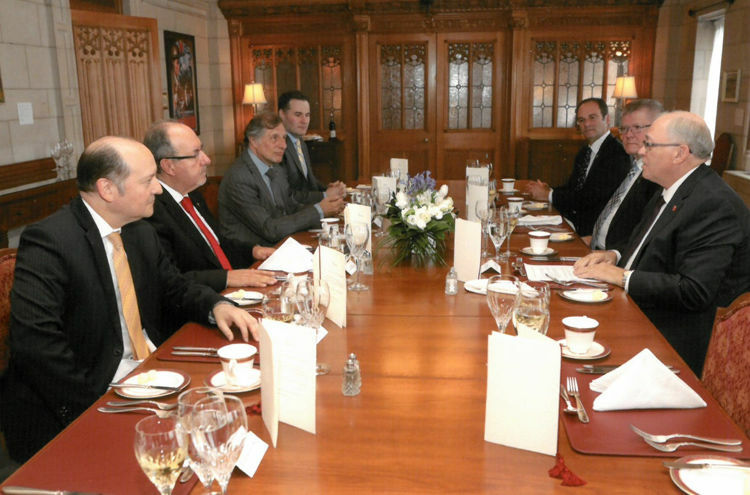 At the invitation of the Speaker of the Senate, The Honourable George J. Furey, Ambassador Roberto Rodríguez Arnillas, together with the ambassadors of Argentina and Chile, shared a working lunch at the Canadian Parliament on Tuesday on November 20. Senators Marc Gold, Jim Munson and Don Plett also attended the luncheon. The occasion served as an opportunity to do a follow up on the recent trip made by the four senators to the three South American countries. On November 14, the Embassy of Peru in Canada participated in a fruitful working meeting, along with the Embassies of Chile and Colombia, and the Director of International Cooperation of Colleges and Institutes Canada (CICan), Mrs. Marie-Josée Fortin, who was accompanied by her team, where issues related to the "Sustainable Development Program and Skills for Employment in the Extractive Sector of the Pacific Alliance" were discussed. The CICan, which is the Association of Technological Institutes of Canada (is the national, voluntary membership organization representing publicly supported colleges, institutes, cegeps and polytechnics in Canada and internationally. ), executes the aforementioned project through Institutional Alliances with specific entities of the member countries of the Pacific Alliance, in order to provide assistance for the development of capacity and training of skilled labour, in the field of the Extractive Sector. 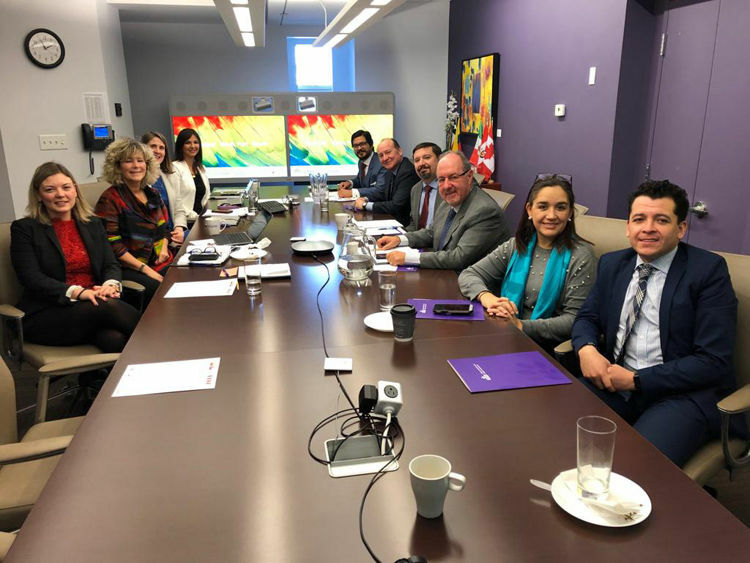 In the case of Peru, the CICan has been closely working with the Ministry of Education (MINEDU) and the Public Higher Education Institute "Honorio Delgado Espinoza" (Arequipa). On November 5th, Ambassador Roberto Rodríguez Arnillas met with Canadian Parliamentarian and member of the Liberal Party, Michael Levitt, who is also the Chairman of the Standing Committee on Foreign Affairs and International Development of the House of Commons. The meeting allowed to highlight the excellent level of the bilateral relations between Peru and Canada, centered on longstanding friendship ties, the coincidence of approach on sustainable development and the defense of democratic principles, which are key pillars for fair and inclusive societies. 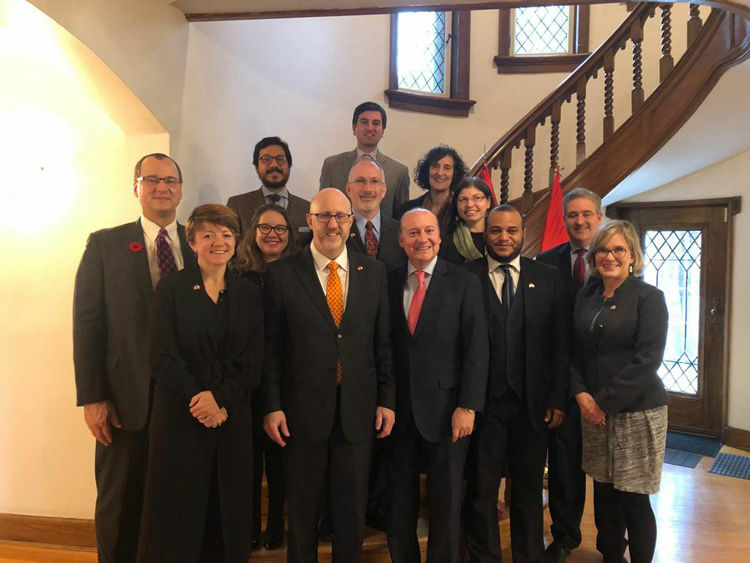 The team of the Embassy of Peru held today a fruitful working lunch at the Official Residence with the Assistant Deputy Minister of the Americas of Global Affairs Canada, Michael Grant and the Analyst of the Foreign Affairs and Defence Policy Secretariat of the Privy Council Office, Erin Koenig, accompanied by Méliné Svadjian, Senior Advisor of the Office of the Assistant Deputy Minister, Jean Paul Lemieux, Director of South America Relations, Chad Fleck, Deputy Director of Andean Countries, Eric Waering, Senior Desk Officer of Peru, Karen McNaught, Senior Policy Analyst (Pacific Alliance), Gail Cockburn, Director of Development at the Canadian Embassy in Peru, Sylvia Cesaratto, Executive Director of North America (former Director of South America) and Christin Azarian, former Desk Officer of Peru. 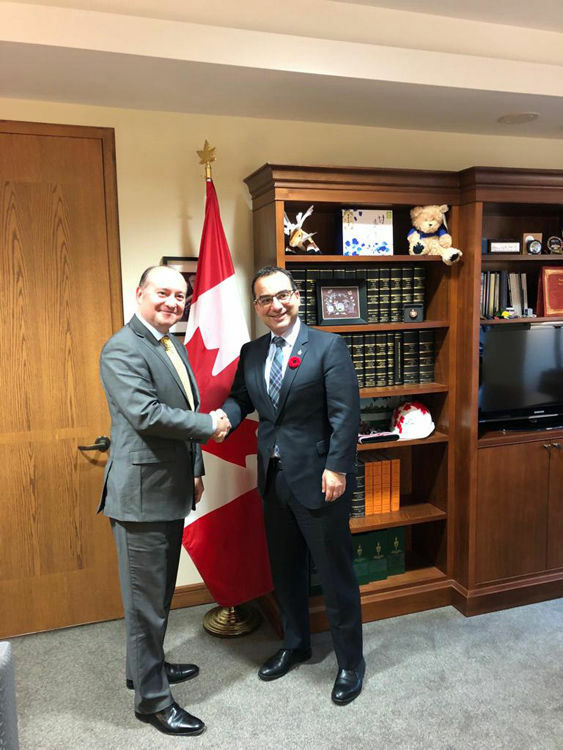 Ambassador Roberto Rodríguez and Deputy Minister Grant made a general review of the current status of the bilateral relationship as well as those actions that could be implemented in order to strengthen even more the excellent level of relations that Canada and Peru have, especially in the framework of the celebration in 2019 of the 75 years of the establishment of diplomatic relations. On October 30, the Ambassador of Peru in Canada, Roberto Rodríguez Arnillas held a working meeting with the President of Fanshawe College, Mr. Peter J. Devlin, which allowed him to see first-hand information about the cooperation that the abovementioned Canadian institution offers for the implementation in our country of the Military Technological Institute. It was also an opportunity to exchange views in relation to the important work that the aforementioned center does in the annual training of more than 40,000 local and other countries' students,and how to channel new cooperation to Peru, considering the labor needs that our country demands at a technical level. On October 30th, Ambassador Roberto Rodríguez met with the MP (Liberal), Alexandra Mendes, having the opportunity to discuss several issues of the bilateral relation, highlighting the commitment that both countries share in the promotion of values and democratic institutions in the hemisphere. 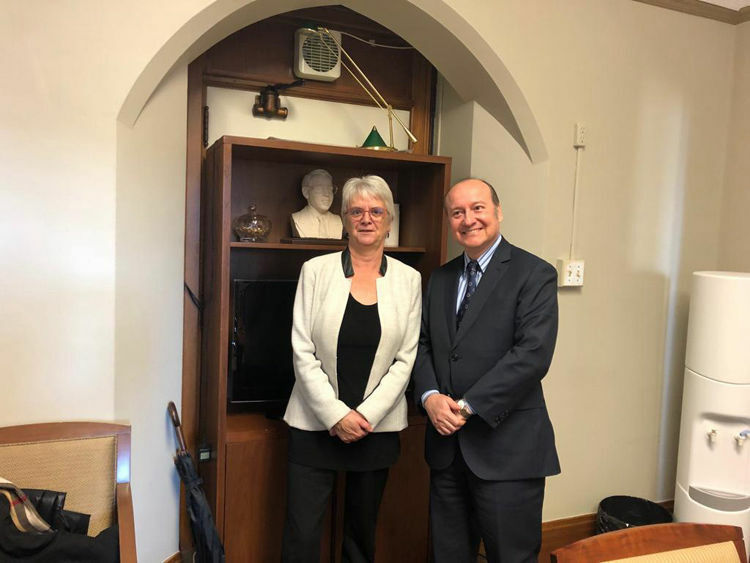 Ambassador Roberto Rodriguez met yesterday with Senator Patricia Bovey, representative of the province of Manitoba and member of the Standing Committee on Foreign Affairs and International Trade of the Senate of Canada. 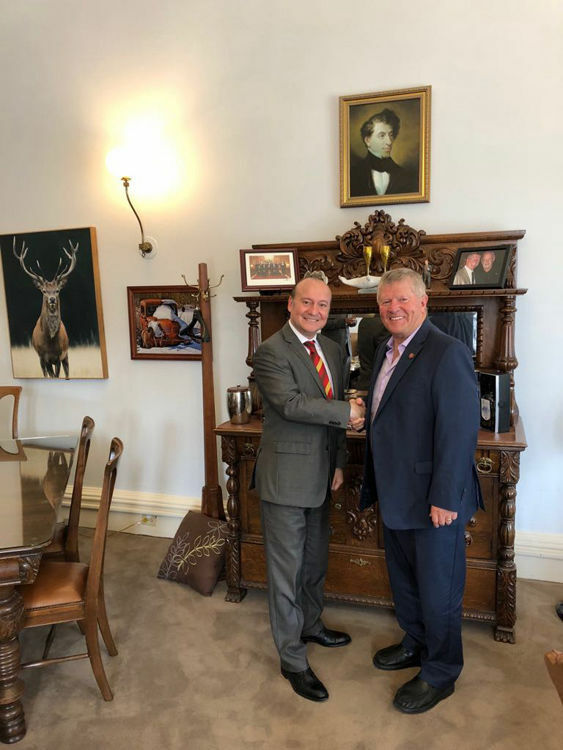 During the meeting, they could change valuable points of view about cultural and artistic promotion, especially focused on the matter of inclusion for indigenous communities and people with disabilities, considering the vast experience of Senator Bovey in this area. At the same time, they coincided in highlighting the rich multicultural heritage that Peru and Canada have and the enormous possibilities of joint work in this field, towards the celebration, in 2019, of the 75 years of bilateral relations between these two countries. 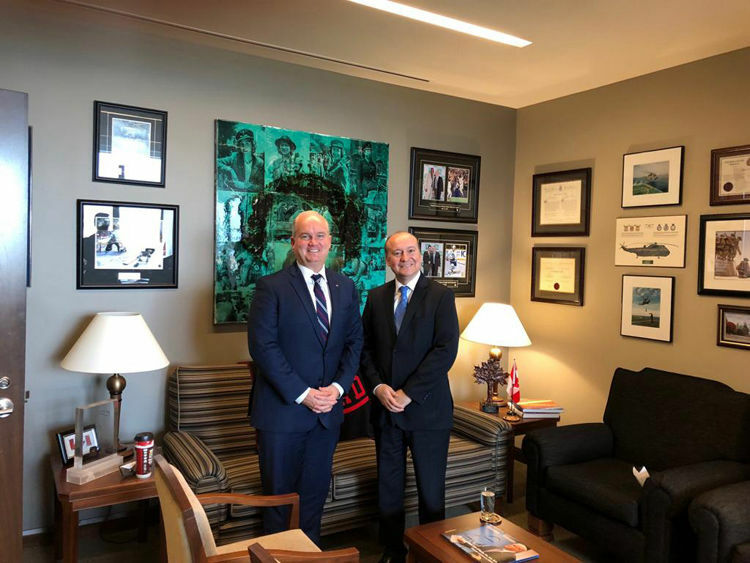 On October 22th, Ambassador Roberto Rodríguez met with MP Erin O'Toole, leader of the Conservative Party in the Standing Commitee on Foreign Affairs of the House of Commons. On this occasion, they exchanged points of view on the progress made in the bilateral relationship, which in 2019 will commemorate 75 years since its establishment. Ambassador Roberto Rodríguez met with the Parliamentary Secretary of the Minister of International Development, MP Kamal Khera, in order to keep promoting the possibilities of bilateral cooperation especially in education and extractive industries focused on indigenous communities development. The meeting was also attended by Mrs. Cheryl Urban, Director General for Latin America of Global Affairs Canada and Mr. Maximilien Depontailler, Senior Special Advisor of the Office of the Canadian Minister of International Development. 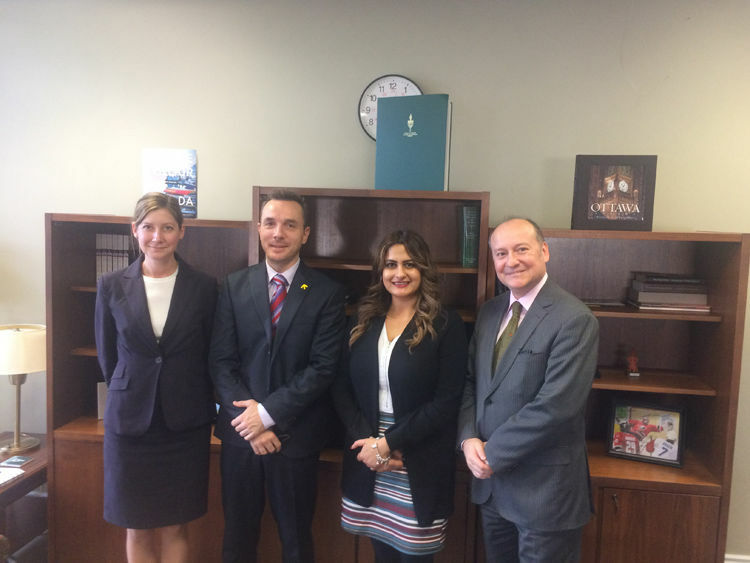 On October 4th, Ambassador Roberto Rodríguez Arnillas held an interview with the Parliamentary Secretary for Consular Affairs, MP Pamela Goldsmith-Jones in which they review the bilateral relation and also possible initiatives aimed to strengthen the frienshipb ties between Peru and Canada. 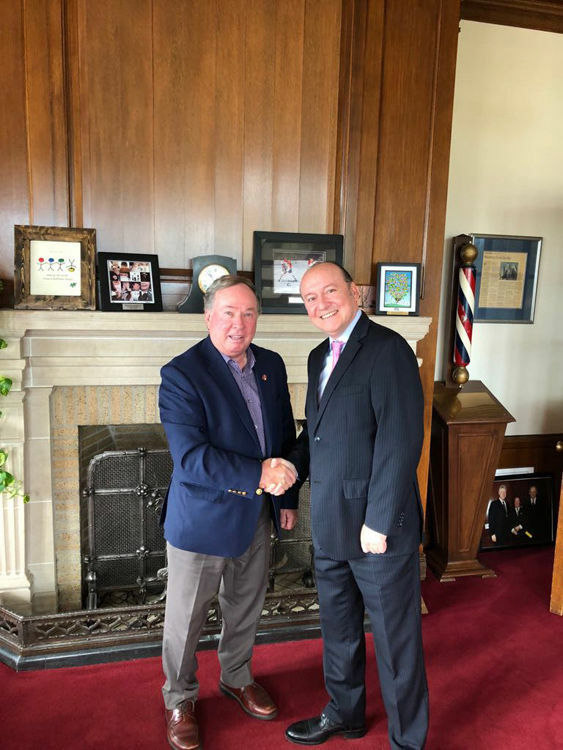 The Ambassador of Peru Roberto Rodriguez met with Senator Don Plett, on the occasion of his next trip to Peru as part of the delegation led by the Speaker of the Senate, George Furey. In the meeting, Ambassador Rodriguez and Senator Plett agreed on the excellent status of the bilateral relations between Peru and Canada.